Congratulations on your new WordPress blog! 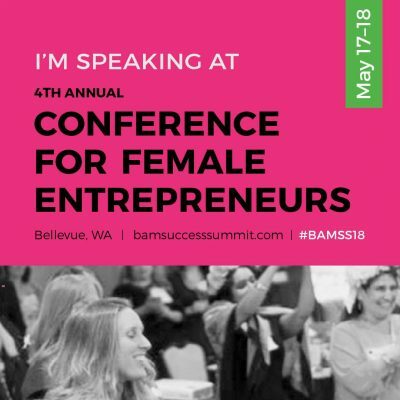 Using a new interface can seem a little daunting sometimes, so I thought it would be helpful to give you a little tour of the WordPress dashboard. 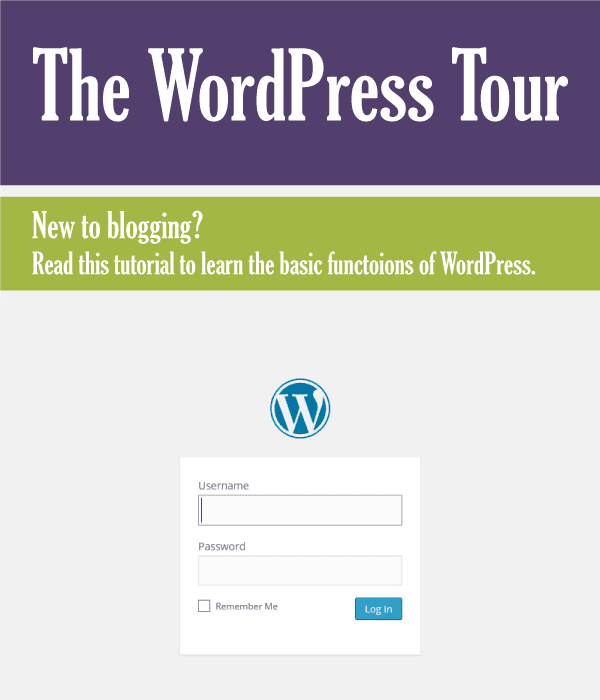 First, go to: yourblog.com/wp-login and log in to your blog. This will bring you to the WordPress Dashboard. On the top bar, you have your administrative links and then a few short cuts to important items that you will most likely check often: updates, comments, and add a new post. The left colored column is the main menu, with the content being in the 2 columns to the right of that menu.. If you click screen options on the top right corner (under your username) you will be able to change the information that you see in your main content section. I never use Quick Draft, so I disabled that box and I am already familiar with WordPress so I disabled the Welcome box. You may want to keep that box around for a while. You can adjust the screen options for every page we are going to discuss today. Okay. Let’s go over the main menu section on the left. Mine is purple. WordPress lets you choose your color scheme, so do not panic if yours doesn’t look like mine. We’ve already gone over the first tab, the Dashboard. On this tab, you can view all of your posts, create a new post, and view/edit your categories and tags. Categories and tags help keep your blog organized into sections. Read more about WordPress posts here. Under the media tab you will be able to view all media (images, video) uploaded to your blog. You can delete, edit, or add new media. Adding new media in this tab uploads the file to your server (host), but not to a specific post. If you want to upload to a specific post, you would do that when creating a page or post. Pages differ from posts. A post shows up chronologically on your blog role. A page is separate from the blog roll and usually provides information that does not change frequently. A few examples are: about, contact, and a portfolio page. Learn more about pages here and your about page here. In the comments section you can view all of the comments on your blog posts. Make sure to check this tab frequently. You can approve/unapprove, reply, edit, or delete. You cannot edit your comment settings in this tab. To do so, go to the Settings tab and then down to discussion. Find more about adjusting the comments settings under the settings tab. Appearance will be one of your most frequented tabs (other than posts and comments). There are 6 sections within appearance: themes, customize, widgets, menus, background, and editor. Themes – change and customize your theme. When you are testing out different themes, it is okay to have a bunch saved here. Once you’ve decided on a theme, I recommend deleting any unused themes so that they don’t slow your website down. Customize – adjust basic design settings. Most of these customization are done in other screens through your WordPress dashboard. Widgets – this is one of my favorite WordPress features. 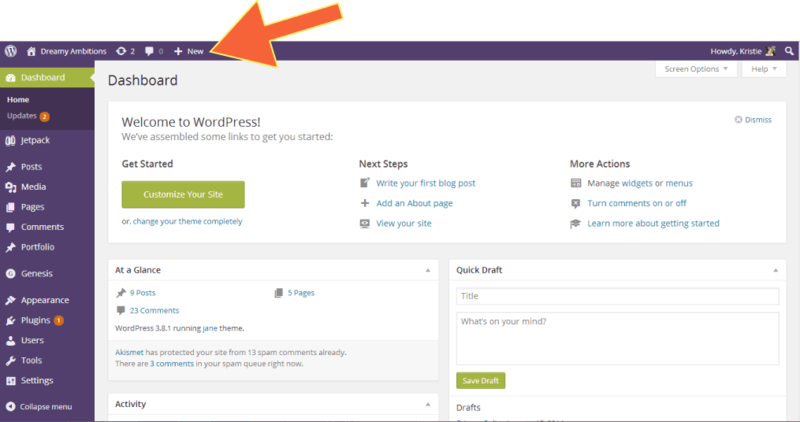 Widgets allow you to add functions and features to specific areas of your blog. Menus – here you can adjust what pages are on your menus. Read my tutorial on it here. Background – easily change your background to a color or upload a picture in the background section. Editor – brings up your HTML, PHP, and CSS files. You can edit these files if you are comfortable doing so, but remember that saved changes cannot be undone. Plugins are tools that allow your blog to do different functions. 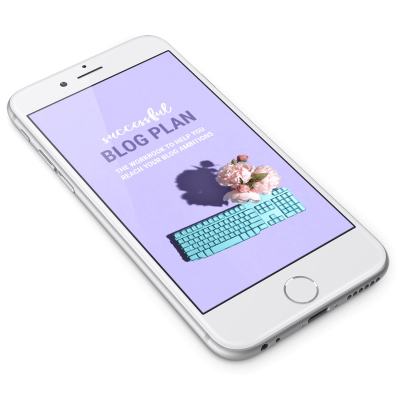 From linking your social media to your blog to displaying a rotating slideshow in your header, plugins can dramatically change how your blog functions. 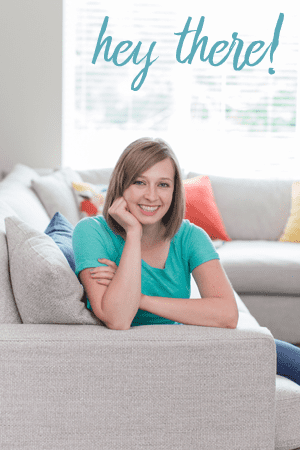 See all the plugins this blog uses. 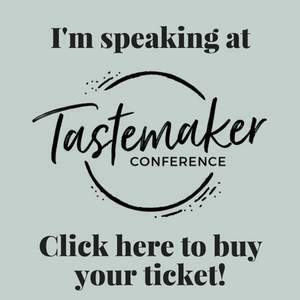 Multiple bloggers? No problem. Under the users tab you can add multiple users and change their authority: contributor, author, editor, and administrator. Administrator has all access. An editor can publish and manage posts of their own and others. An author can also publish posts, but can only manage their own. A contributor is someone that can write and manage their own posts, but cannot publish them on their own. 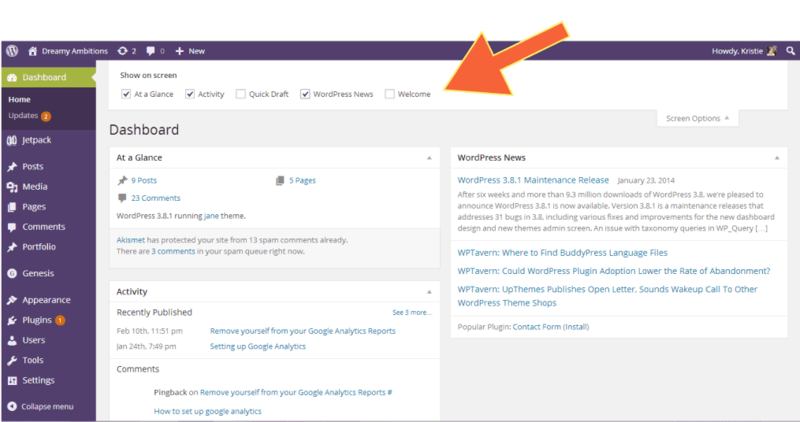 Another thing you can do in the User’s section is adjust your display settings for your WordPress dashboard.Do you want your dashboard to be purple too? Click the user name that you would like to adjust and you will be able to change your dashboard color. This is a new feature in WordPress and I’m glad that color is on the comeback, white everything on the web was so boring. This is a tab that isn’t used very often for most bloggers. Here you can export/import content to and from your blog. For example if you wanted to back up your blog, you could export it. If you were migrating from Blogger you would import content. In addition to the import/export functions, there are 2 pre-installed tools: Press This, and Categories and Tags Converter. I have never used either of these. There is so much to discuss in the Settings tab I decided to create a whole new post on adjusting your WordPress settings. That wraps up our beginner WordPress tour. Are you feeling more comfortable with using WordPress? I hope so! What’s Next? Adjust your Settings. Previous Post: « Adjust your WordPress settings.